Brown Book Band, Oxford Level 9: Crunch Time! Order this title, or any title from our Booktoberfest showcase by October 31st, and you could WIN A YEAR'S WORTH OF BOOKS! * That's a $50 Booktopia gift voucher each week for 52 weeks. 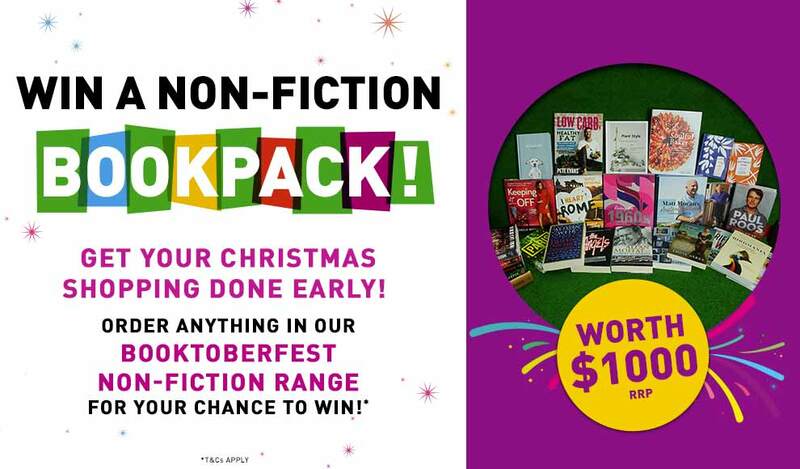 But that's not all, by ordering any non-fiction title from the showcase, you will also go in the draw to win a non-fiction book pack worth $1000 RRP. *Terms and Conditions apply. So you want to lose weight? Why settle for half a kilo here and there when you can lose more weight faster - and keep it off! Michelle Bridges, expert trainer from The Biggest Loser, is here to help you do it. Crunch Time is jammed with the information you need to turn your life around. Michelle Bridges has worked in the fitness industry for eighteen years as a professional trainer and group fitness instructor. Her role as a trainer on Channel Ten's hit reality weight-loss show The Biggest Loser has made her Australia's most recognised personal trainer. Michelle has travelled the world presenting at global fitness conventions and competing in physique and fitness competitions, and is sought after as a motivational speaker. The Crunch Time Cookbook is her second book. Her first, Crunch Time, was a bestseller. I have used this book in combination with the 12WBT program that Michelle Bridges has online. The sample menu is really pretty tasty and practical - items are easily available and not too expensive. She's a bit whizzbang but this must be one of the better books of its kind. It's official. Australia is now the fattest nation on earth, with a whopping nine million of us overweight. It's a shocking statistic, but this is exactly what we need. This is the tipping point on the scales for all of us - our lowest ebb, the moment where we wake up and smell the coffee. Now is the time to take control, get real, get moving and change our bodies - and our lives. What I find fascinating is that we all agree on what we need to do to manage our weight - regular exercise and healthy eating - yet we still don't seem to be able to agree on exactly how to achieve it. As you probably know, I am a trainer on The Biggest Loser, the hit television show where two teams of overweight contestants undergo rigorous physical training, a strict wholefood diet, and compete against each other in a variety of activities. After sixteen weeks, the individual who has lost the most weight is declared the overall winner. I felt privileged to be part of these people's life-changing experiences and thrilled when other people told me they were so inspired by the show that they had re-configured their own lives, and become fitter and healthier. (We even had the sound and camera crew on the set losing weight because they were listening to both my colleague Shannan and me day in, day out!) But more than this, the show forced me to re-examine some long-held assumptions I had about weight management. I had always told my clients that losing weight in small increments was the right way to go - do it slowly and don't worry if you put some back on, it will be more effective in the long run. And yet the most amazing results on the show were achieved by practising the exact opposite. Every week, the contestants climbed on the scales and showed the most dramatic weight loss - 5, 6 and even 10 kilos - and their health improved swiftly: blood pressures came down, blood sugar levels dropped out of the danger zone and cholesterol lowered. I started to question everything I had done in the past, and was stunned to realise that there is no correlation between the speed you lose weight and your ability to keep it off. With gradual weight loss - half a kilo here, no change for a week - you are more likely to give up than to succeed. Lose it fast, let your success motivate you to stay on track, get your health and life back quickly and kick your old life to the kerb. You've bought this book because you feel the need for change. With Crunch Time, you can achieve what the contestants did on The Biggest Loser. Whether you want to lose 5 kilos or 50 kilos, this book will show you how. It's going to be hard work, but if you commit to the workouts and follow the nutrition plan you will see drastic changes in your body. But only you can make the change - the book can't do it. I can't do it. No one can do it except you. This kind of dramatic change will take you well out of your comfort zone, but let me ask you something: which discomfort would you prefer? The 'I hate the way I look, I can't fit into anything and I feel like crap' kind, or the 'I'd better get my runners on and take the dog for a run and tonight I'll have grilled fish with no alcohol for dinner' kind? Which of these scenarios is really the most uncomfortable? Once you have the nutrition and the exercise in place, weight loss is an exercise in mathematics; for most of us it's pretty much calories in versus calories out. But The Biggest Loser taught me that you cannot expect to lose weight and keep it off if you're still carrying emotional baggage. If you do not deal with the psychological aspect of weight loss, the physical just isn't going to happen. In the first section, 'Get Real', I will help you get your head sorted so you can address the emotional issues behind your struggle with your weight. Let me tell you - most people don't get messed up in the head because they are overweight; they become overweight because they are messed up in the head. If you are going to find the solution to managing your weight permanently, then all the diet and exercise books in the world won't help unless you re-program the way you think about food, exercise and ultimately yourself. In the second section, 'Get Moving', I will guide you through a series of killer workouts. I have worked in the fitness industry all my life and I know the best exercises for rapid weight loss. But I'm not going to lie to you ­in most cases it took years for you to put the weight on, so it's going to take real guts and determination to lose it. You absolutely must follow the exercise and nutrition plan for at least twelve weeks. Some of you will reach your goal weight before twelve weeks, others may need to continue for a few extra weeks, but whatever your individual needs, this program works! In 'Get Cooking', I show you how to minimise calories and maximise your nutrition. There is no way on this planet that you can accelerate yourself to lean and mean unless you put some time into the kitchen, so I've included some of my favourite recipes. I'm here to help you find the real 'you' ­the person who knows what they want and knows how to get it. You'll be your own personal trainer with this book, but you won't be alone. Let me lay it on the line for you - your struggles are my struggles. Your demons are my demons. I have battled with my weight just as you have. But I will not tell you what you want to hear. I will give it to you straight, because I am standing right there beside you in this. I understand. But what I want from you in exchange for this empathy is your trust and commitment. No more laying the blame at someone else's feet. No more lying to yourself. It's time to be true to you. And I will be here, every step of the way to guide you through it.